The Civic Trust Auckland Annual General Meeting this year will be held on Sunday 22 November from 3pm in the lecture room at the Leys Institute, 20 St Marys Rd, Ponsonby. Public transport information is available from Auckland Transport on 366 6400 and there is parking in St Marys Road or in the library’s large carpark: go past the library on St Marys Rd, turn left into Caroline St, then left into Dedwood Cres. There is a path from the carpark to the front of the library. We especially welcome attendance at the AGM of those who have become members during this last year. Following the AGM, one of the librarians will take us on a tour of the library, visiting spaces not open to the public, which contain historic graffiti, murals and a century of library paraphernalia. 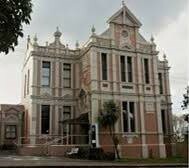 The building itself dates from 1905 and is a Heritage NZ Category I historic place.